As part of Art Design Chicago—a citywide celebration of the city’s arts and design legacy—the first U.S.-based marathon by Hans Ulrich Obrist will be held this weekend. Obrist’s career as a documentarian has been strongly influenced by the late Chicago raconteur Studs Terkel, whose first book of oral history was the landmark Division Street, America (1967). Amanda Williams, Art Green, Barbara Kasten, Brandon Breaux, Cauleen Smith, Dawoud Bey, Eddie Bocanegra, Eula Biss, Eve Ewing, Fatimah Asghar, Gerald Williams, Jeanne Gang, Joseph Grigely, Stanley Tigerman, Theaster Gates, and Tim Samuelson will join Obrist at Navy Pier, the site of EXPO CHICAGO, which is collaborating on the event with the Chicago Humanities Festival. Saturday, September 29, from 1 pm to 6 pm. Navy Pier, 600 East Grand Avenue, downtown Chicago. This entry was posted in ARCHITECTURE, ART, CONVERSATION, DESIGN, EDUCATION/ACTIVISM, LITERATURE/POETRY and tagged Amanda Williams, Art Design Chicago, Art Green, Barbara Kasten, Brandon Breaux, Cauleen Smith, Dawoud Bey, Division Street America (Terkel), Eddie Bocanegra, Eula Biss, Eve Ewing, Fatimah Asghar, Gerald Williams, Hans Ulrich Obrist, Jeanne Gang, Joseph Grigely, Louise Bernard, Obama Presidential Museum, Stanley Tigerman, Studs Terkel, Tabitha Thorlu-Bangura, Theaster Gates, Tim Samuelson on September 27th, 2018 by Barlo Perry. 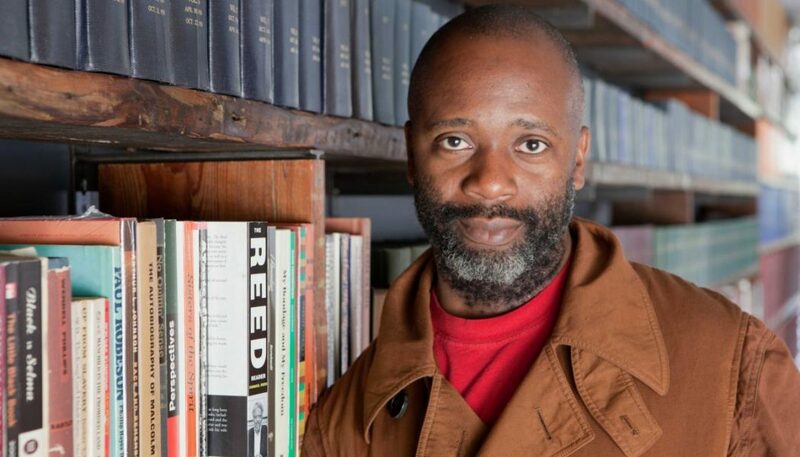 Artist Theaster Gates—founder of the Rebuild Foundation, initiator of such projects as the Arts Incubator in Chicago—will be at CAAM this week in conversation with the museum’s deputy director and chief curator Naima J. Keith. THEASTER GATES, Wednesday, January 24, at 7 pm. This entry was posted in ART, CONVERSATION, EDUCATION/ACTIVISM and tagged Arts Incubator, California African American Museum CAAM, Naima J. Keith, Rebuild Foundation, Theaster Gates on January 22nd, 2018 by Barlo Perry.